Stratford Station opened in 1839 on the Eastern Counties Railway. It became a transport hub in the 1990s and was a major station for the Olympics. It is linked to a new Westfield shopping centre which has views over the Olympic Park (from John Lewis store). Cross Great Eastern Road into the Stratford (shopping) Centre. The Shoal is a kinetic sculpture of 80 titanium leaves. The mall is lined with market stalls as it was built on the site of Angel Lane Market. Walk through to the centre then go left (North). This emerges into Gerry Raffles Square. Continue into Theatre Square. The Theatre Royal was built for William Charles Dillon in 1884 to the designs of James George Buckle and refurbished by Frank Matcham in 1902. Between 1953 and 1979 it was taken over by Joan Littlewood's Theatre Workshop. It was threatened by the development of the Stratford Centre but saved by a public campaign and the efforts of manager Gerry Raffles. The current restoration and extension was undertaken 1993-2001 [theatre website] Adjoining is Stratford Circus and opposite is the Stratford Picture House. Return via Salway Road to the Broadway. Opposite is the new Stratford Library (1999-2000). Outside are memorials to Gerard Manley Hopkins, who lived in a house nearby (demolished) and Edith Kerrison, the first woman to serve on West Ham Council. Follow the Broadway to the right and then the left going around the church island. St John's Church was built in 1832-4 by Edward Blore and became the parish church in 1844. There is a memorial of 1879 to Protestants burned at the stake in 1555-6. [church website]. Opposite is the Edward VII pub remodelled in the early 19th century and renamed (from the King of Prussia) in 1914. Adjoining this is the former London & Counties Bank (1867 & 1904). Go along Romford Road walking on the right hand side. The Old Dispensary is an 18th century timber-framed and weatherboarded building. It operated until 1861 when Mary Curtis provided land in West Ham Lane for a new dispensary. Opposite is a former Working Men's Club (1904), refurbished in 2002. System House was built as public offices in 1910. There are 19th century villas and terraces further along. Go into Water Lane to the left. There is a Stratford Common marker on the corner, relocated from the east side of the common (now Caernavon Road). The fine Central Library and Technical Institute was built in 1898 on the site of Gallows Green. Designed by JGS Gibson & SB Russell it was financed from a share of custom duties collected by the PLO. In 1992 it became the University of East London's Stratford Campus. Opposite were the premises of West Ham Electricity, opened in 1906 and rebuilt 1927-30. These have now been converted to apartments. Continue along Romford Road walking on the left hand side. The Passmore Edwards Museum was built in 1899 and housed the Essex Field Club's collection (until 1994). It is now used by the university. Opposite is Bow County Court, built in the 1950s. The new fire station opened in 1964. The Pigeons pub was built in 1898 and now houses a Tesco store. There is a new development for the Toynbee Housing Association. Bear left at Vaughan Road then go along Mathews Park Avenue. On the left is a board school. Some houses retain attractive path and porch tiles. Cross and enter West Ham Park at Linden Gate. Linden Cottages are to the right and a Wildlife Garden to the left. The park dates back to 1566 and was originally part of the Upton House estate. From 1762-80 it was owned by philanthropist Dr John Fothergill who established a botanical garden. In 1812 the banker Samuel Gurney acquired the property. The house was demolished in 1872 and the grounds sold on condition they became a public park. 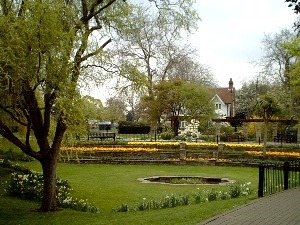 It has been maintained by the Corporation of London since 1874 and is Grade II listed. There are maps at the entrances or they are available at the park office. Explore the northern half at this stage and the southern half on the return. Walk to the south of the cricket pitch for views of Canary Wharf and Stratford Church (trees permitting!). Exit at the Margery (NE) Gate and go right along Ham Park Road. At the end go left along Upton Lane. The former Upton Cross Church is now a glass warehouse. The grounds of Clapton Football Club (founded in 1878) were formerly a cricket pitch. The Old Spotted Dog was originally a 16th century timber-framed hall deriving its name from Henry VIII's hunting kennels. During the plague in 1603 city merchants used it as an exchange. There were additions to the building in the 19th century. Sadly it is now boarded up. The Red House of 1760 was remodelled in the 1880s and became a social club. Right along Doris Road and left into Upton Lane. Meggs Almshouses moved from Whitechapel Road in 1893. On the right further along is a view of the park nursery. This produces some 200,000 plants for use in the City's parks and gardens and at state occasions. There is no public access but tours can be arranged with the park office. Re-enter the park at the Nursery Gate. Go to the left of the playground/paddling pool and right at East Lodge. There are park facilities here. Enter and explore the seven acre Ornamental Garden opposite. Exit by the Iris Garden and go around the parks office. Continue past the Bandstand and to the right of the all-weather pitch. Take the path to the left and explore the Meadow Area. Exit at the South Gate and go right along Portwey. This is an ancient route between the village of West Ham and hamlet of Upton. Park Cottage has some attractive features. Park Tavern probably opened at the same time as the park. At Vicarage Lane cross Portway and take the footpath alongside the school. Left into Church Street. The Angel pub, rebuilt in 1910, has an old advertisement painted on its side wall. Go into Gift Lane on the other side to view Harris Cottages. These almshouses of 1939 replaced those founded in 1633 by Roger Harris. Walk back along Church Street to the south of the church. All Saints belonged to Stratford Abbey. It was rebuilt in 1180 and enlarged in the 13th century. The tower was added in the 15th century and the side chapels in the 16th. The clock, made in 1857, is said to be the prototype for Big Ben. Enter the churchyard at the corner and walk diagonally across to view the north side of the church. Cross Densham Road into Vicarage Lane and go into Stratford Park. The park was laid out and opened in 1898. It has a number of labelled trees. Take the path to the right between the tennis courts and bowling green. Ahead is a colourful, award-winning performance space. To the left is a fountain. Bear left to a Sensory Garden. There are children's facilities to the right. Exit into West Ham Lane and go right. On the left is the Methodist Church of 1965 and Jubilee Hall of 1897. Opposite housing has been built on the site of West Ham, later Queen Mary's, Hospital but the gateway has been preserved. Return and continue along West Ham Lane. On the corners of Mark Street are the former district office of the TGWU (1939) and the new Unitarian Church. The former police and coroner's court was built with the town hall extension in 1884 and enlarged in 1901. At the end go left along Broadway. The former West Ham Town Hall was opened in 1869 and extended in 1884-5. It was restored after a fire in 1982 and re-opened as a public hall in 1986. The election of the first Labour MP, Keir Hardie was announced here in 1892. Adjacent to this building was the fire station, a small section of which survives. The remainder was rebuilt in 1877 and 1900 but closed in 1964. Further along is Ye Olde Black Bull pub of 1892. On the corner with Chant Street is is the former Parr's Bank (1897-8). Number 413 was a post office and 399-401 the London & South Western Bank (1913). Return towards the island and follow signs back to the station.